When searching for an experienced commercial foundation repair company, your choices may be limited. Most repair companies only have experience with residential structures. At Matthews Wall Anchor, we offer a wide variety of commercial and industrial repair jobs for businesses in Ohio. We use underpinning, shoring, and piling solutions to stabilize and support large structures. Our structural services include underpinning, shoring, and piling to stabilize and support new or existing structures. Some applications include bridges, retaining walls, towers, and foundation walls. For commercial foundation repairs, we use the latest products and materials from Earth Contact Products (ECP). ECP is the leading manufacturer of the foundation repair industry. 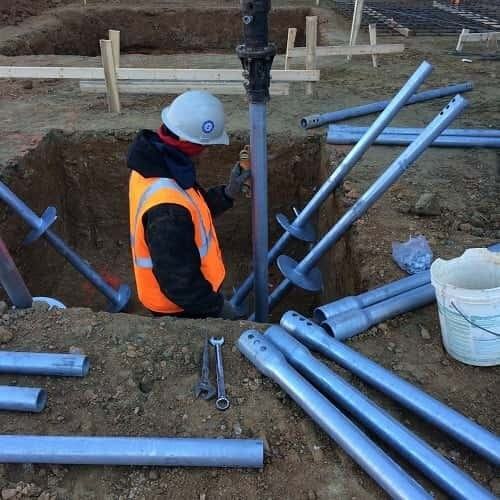 Our products include helical piles, augercast piles, steel piers, and soil nailing. These products are designed to support, strengthen, and stabilize weak foundation walls. We also offer commercial services such as snow removal, traffic assistance, road prepping and gas well industry traffic control to ensure safe and punctual service in the Ohio area. If you have questions or concerns about your Ohio business, our staff can assist you. We provide free quotes for every project so you’ll know what to expect before the starting the project. Contact Matthews Wall Anchor today! We look forward to returning the structural integrity to your business and commercial property.